The following content is a brief and informal pre-requisites guide to setup, configure and test delivering virtual apps from the Microsoft Azure Marketplace by Citrix Cloud XenApp essentials service before de-ploying in a PoC, Pilot or production environment. The content of this blog is based on own personal assessment and do not necessarily conform to industry descriptions or best practices or that of the views of Citrix. Azure subscription is required with a resource group defined with a virtual network. Define your preferred Azure region. Your AD strategy can be decided with Active Directory situated in the Azure resource location. Use a min A3 Standard VM instance for AD in that case or “Azure Active Directory domain ser-vices, ” and eDocs can be utilized before implementing Azure Active Directory for the XenApp Essentials Services. Only Machine creation services (MCS) based provisioning is support for public (Iaas) clouds and this Service hosted by Microsoft Azure. Microsoft Azure RemoteApp (ARA) – which provides the simplistic beauty of Microsoft Azure Remote-App deprecated over time and now is replaced with Citrix XenApp having “Secure by Design” enterprise security methodology, platform scalability with FMA in 7.x and High Definition Experience (HDX) virtual app delivery protocol capabilities. ARA incorporated Remote Desktop Services (RDS) capabilities from a multi private cloud deployment on MS Windows Server to MS Azure with non-persistent RDS/RDP sessions delivered. Again this delivered only from Microsoft Azure cloud. 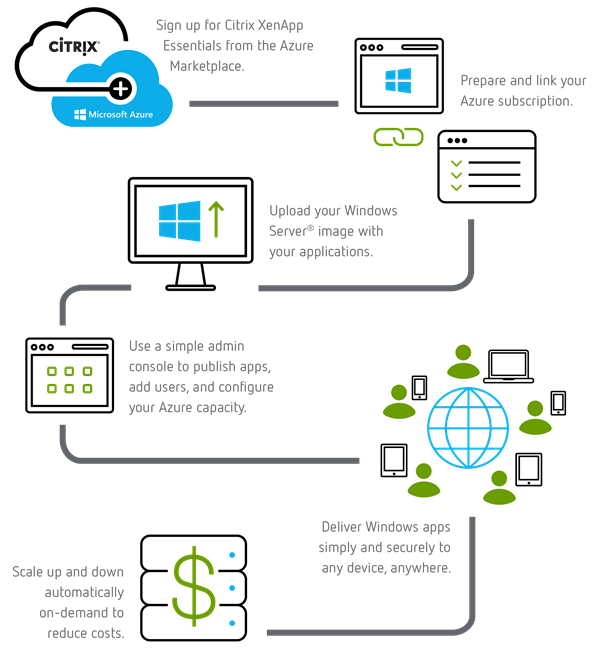 XenApp Essentials Service is only available from Microsoft Azure Marketplace hosted on Azure. It supports the delivery of Windows apps from Windows Server 2012 R2, 2016 prepared templates or customized templates. Based on the image above here is step by step procedure for XenApp essential deployment. Note that steps can change as the service is delivered from secure SaaS-style Citrix Cloud with the ever-green control plane. Before you begin, ensure that you have the subscription to XenApp Essentials Service from Azure Marketplace + Server Images + RDS CALS w/SA. StoreFront FQDN which provides secure remote access via the NetScaler Gateway Service also review caveats re bandwidth throughputs below. Launch an app if an existing RDS session is present on the XenApp VDA is not permitted. Each end-user is limited to 1-GB outbound data transfer per month, can be increased to 25 GB limit with add-on via the Azure Marketplace. The XenApp Essentials provides secure access to virtual Windows apps. This service is based on proven XenApp and XenDesktop technology. Citrix Cloud hosts this Service; it includes the workspace experience and the NetScaler Gateway Service along with core management services. Your app workloads run in your company Azure subscription. Users can connect to your on-premises data center. Connections between the Azure cloud and on-premises data center occur through a secure VPN connection. Users connect through XenApp Essentials to file servers, license servers or Active Directory over a secure VPN connection. Image Credit by Citrix systems.